Social Media Market is a relatively new Instagram promotions provider. Their biggest appeal is the high quality of services they provide and the price of their packages. They have also claimed to offer strong customer support and protection policies. To test all of these claims, we bought 1000 Instagram followers from them. These were delivered within just a day after we ordered them. The followers we got looked mostly like real users, and the package was reasonably priced at under $10. Social Media Market is one of the few providers that offers up to 300,000 followers. Their customer support staff were very responsive. We got answers to our initial purchase questions two hours after we sent an email. Their refunds and retention guarantees are fairly standard, but are still reliable. We recommend Social Media Market if you want to get a large package of good followers that will solidify your image as a popular Instagram user. 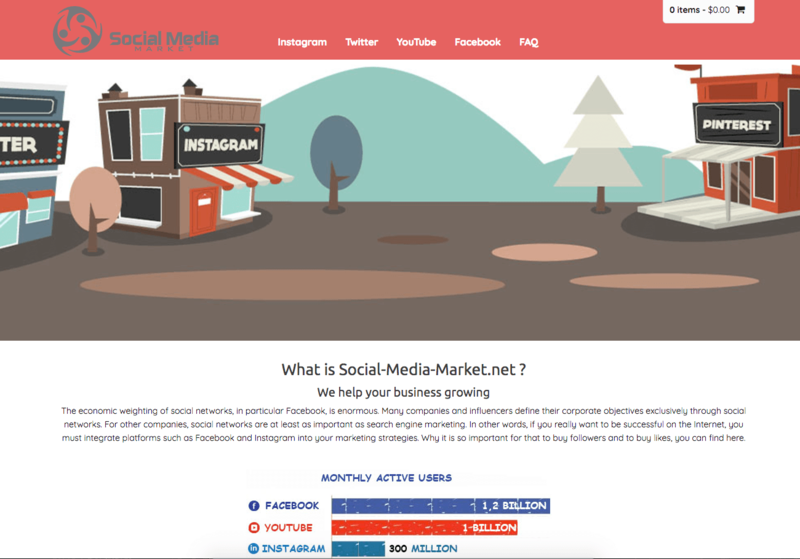 Founded in 2016, Social Media Market is a German company that offers marketing services for different platforms. In those few years they claim to have had over 10,000 customers. They have all of the essential Instagram services that you will need, including followers, likes, and comments. 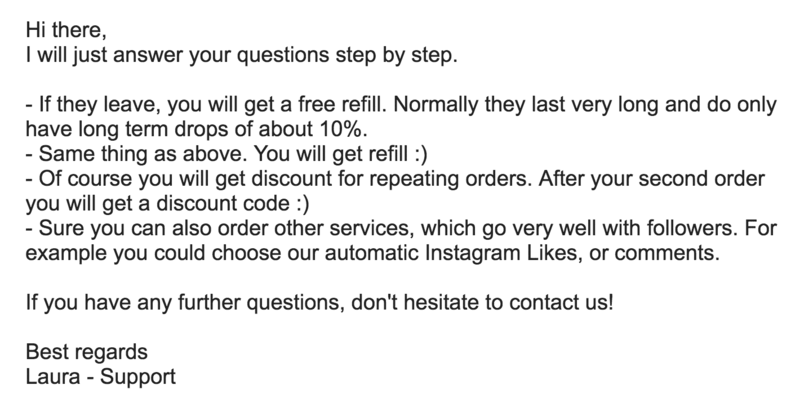 Social Media Market also offers some unique services, like their Dripfeed Instagram Followers. They also have their "Instagram Careless Packages," which bundle several services together. Other platforms that they have services for are YouTube and Facebook. Despite being a fairly recent entrant in the industry, Social Media Market has become a popular choice for many clients. This is largely due to the extensive customer support and guarantees that they offer, as well as competitive prices. Social Media Market offers Instagram followers, likes, and comments. Their follower plans are larger than some other providers, starting at 1000 followers and going up to 300,000 followers. Delivery is done within 48 hours after your purchase depending on the size of the package. To order, you just need to select your desired amount of followers and give them your Instagram page URL. Social Media Market accepts Paypal and major credit cards as methods of payment. Social Media Market states that they confirm orders for processing by sending an email. As such, it is your responsibility to ensure that the email address you provide is correct for faster processing. The company says that all customers are issued contracts for their orders, which can be viewed by logging into your customer account. Social Media Market says that all of the prices indicated on their website are already inclusive of VAT and other taxes. Payment should preferably be done with Paypal. In the case of alternative payments, the relevant rules for these methods will apply. The company states that they have no liabilities for any damage that might happen to your Instagram account after the purchase and delivery period. This includes potential losses of your Instagram followers and likes. In case of disputes, Social Media Market says that German Law will be the one applied to settle them. Social Media Market declares that they use log files to collect and store various non-personal information about your visit to their site. This information is used only for improving the delivery of their services and improving your user experience. The information is temporarily stored on their servers and automatically deleted afterward. They apply the same principles when handling email correspondence from you. All of the personal information you have provided in your emails are only used for properly answering your questions and inquiries. They can also use your email address to send newsletters and other marketing materials, provided that you have given consent. All of the information you give is automatically deleted after use. Lastly, the site states that they do not sell or share your information with third parties. Any such sharing will occur only under your explicit consent. You also have the option to have your data removed from their servers anytime. While there is no information provided on their site, our conversation with Social Media Market’s customer support staff confirmed that they do offer refunds. Full refunds are applicable in case your orders are not delivered or there are errors in the delivery. To request a refund, contact them via email at contact@social-media-market.net. Social Media Market says that, in case of lost followers, they offer refills up until 30 days after your purchase. There are instances where they can grant refills beyond that period. To get these refills, you need to contact them at contact@social-media-market.net through email. Social Media Market mainly uses email to provide customer support, with their address being contact@social-media-market.net. They also have a phone number, +49 17645863426, and a mailing address that can both presumably be used by customers to reach them. Before we made our ordered to them, we sent a few questions through their contact page to see how their customer support reacted. Unfortunately, we never heard back through this method. We then tried their email address, and we got a friendly response very quickly. If you need to get in touch with Social Media Market, we recommend using their email address. "Normally the followers will be delivered within 24 hours." "If they don't show up soon, you will of course get a full refund of your money." "As you want. We can do both, you just have to tell us how you want it." "The quality of our followers is described on the product site. If you want you can of course get a free example. Just tell us your profilename." "Nobody will know that you did this. This is because our followers are really authentic." "The users of course won't harm you or your account in any way. They follow you for a small amount of money and the job is done for them." "We of course refill the drops costless." "When the followers are not delivered already or if we have made a mistake you can of course get your full money back." After our order finished, we sent another set of questions to see if they would treat a paying customer the same as a prospective customer. We got a response back from them quite quickly, hitting all of the points of concern we raised. This was a great response! "If they leave, you will get a free refill. Normally they last very long and do only have long term drops of about 10%." "Same thing as above. You will get refill :)"
"Sure you can also order other services, which go very well with followers. For example you could choose our automatic Instagram Likes, or comments." "Of course you will get discount for repeating orders. After your second order you will get a discount code :)"
With the large follower packages that they provide, Social Media Market is a great recommendation for those looking to significantly boost their Instagram profiles’ popularity. The company’s “Instagram Careless Package” is a perfect all-in-one service that could help you meet both your growth and engagement goals in a single purchase. This package also prevents anyone who might look deeper into your account from thinking that you’ve bought a service, as all your essential metrics (likes, followers, comments) are high. The followers they deliver are of good quality overall, which is essential if you want your large purchase to really matter. We ordered 1000 followers from Social Media Market. These followers started coming quickly, with our entire order being completed in just 12 hours. This is well within the 48 hours the site says is their maximum delivery time. Social Media Market says they provide high-quality international followers. These users come from all over the world, including Turkey, Russia, the USA, Brazil, Indonesia, South America, Thailand, and China. The Instagram followers that we got from Social Media Market look almost like actual users. They had complete and unique profiles, with decent account activity, like recent posts. The only thing you won’t get is them engaging your posts. It took a full week before we began seeing some drops in our follower numbers. By the second month after our purchase, we still had 84% of the original followers we bought. This is in line with Social Media Market’s claim that their followers would not drop easily. Social Media Market has a variety of options to increase your followers and engagement on Instagram, YouTube, and Facebook. They offer high-quality followers from countries like Brazil, China, Indonesia, Russia, Thailand, Turkey, and the USA. You can start with 500 followers or go big with 300,000 followers. The company also offers an “Instagram Careless Package,” which is an all-in-one service that includes likes, followers, and comments. Social Media Market provides high-quality followers with profile photos, uploads, and followers. They claim to offer a 100% safe and discreet service, fast delivery, and premium customer support. The company also offers a 30-day guarantee which promises to replace any followers lost within that period. Overall, Social Media Market is a good choice for authentic looking Instagram followers. With several packages in different price points, and their innovative yet awkwardly named “Careless Packages,” they could help you reach your goals within your budget. Check them out by clicking the button below right now! My order arrived within 24 hours of ordering. I loved the fact that the customer support got back to find out if i was satisfied with the service i got. They were also very patient with me throughout our engagement. The customer support has to be mentioned first. I got in touch with one of them and she gave me a comprehensive explanation of how their service works. I got the instagram followers i ordered in a space of less than 16 hours. I got great service from them. I love the fact that despite being quite affordable, these guys deliver followers that are attainable. I'll definitely recommend these guys to anyone. The customer support who responded promptly assured me that the protection policies they had stated were well in place and i subsequently ordered 1000 followers. A majority of the followers i got looked authentic with photos and followers, this is important to someone in my line of work. I love their customer service. These guys make deliveries swiftly too. I would definitely recommend them to anyone. I'm so pleased. I'm really loving their Instagram service. This is a good place to start to have your followers and kick off your way to gaining social proof. It's really easy to order from them. They accept all major credit cards including paypal. Guaranteed safe. Good experience with their customer support. Customer service is very responsive. This adds value to the customer and thus building trust and confidence. They also deliver good quality followers. Keep it up! The followers I received look real and active. I'm glad I bought from them. The prices for their services are very competitive and the quality is very good. I would recommend them to everybody.